I recently saw someone post on Facebook that there are only 20 Fridays left until Christmas. And while that seems a little bit crazy, I figured today was as good a day as any to feature this Winter Wonderland wedding cake. 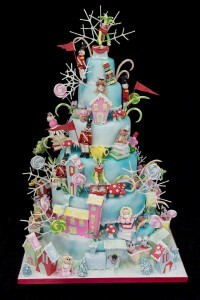 Our good friends at Hockleys Cakes created this whimsical cake for a winter wedding. The cake reflects a “Toytown” theme. The six tier cake features a blue sky background which enhances the colors of the toys, animals, and buildings that are on display. The items on the cake include toy soldiers, jack-in-the-box, teddy bears, candy sticks, lollipops, and even a Christmas tree. There’s also snow and ice covered buildings – a true winter wonderland. And all of the items on the cake are edible, which makes it that much more delicious! You might not be thinking about winter yet (I know I’m doing my best to avoid it), but you have to admit this is a fantastically fun cake and it would be an incredible centerpiece at your reception!